George Orwell is one of the most iconic writers in literature. His book Animal Farm inspired such pop culture figures as Pink Floyd (1977, album Animals was inspired by Animal Farm), Radiohead (Song Optimistic) contains a lyric mentioning Animal Farm), The Clash (used an image from the 1954 animated movie Animal Farm on their single English Civil war)… etc. But did you know that Ukrainians were his earliest fans and the first language that the tale was translated into was Ukrainian (1947)? Orwell’s book Animal Farm told the story of Soviet atrocities, including the Holodomor. After the book was published in 1945, it was discovered by a twenty four-year old Ukrainian refugee in Germany named Ihor Sevcenko, who then shared it with his friends in a refugee camp. Together they wrote a letter to Orwell in London and worked with him to translate Animal Farm into Ukrainian. Come and hear the incredible story of how Ukrainians became some of the first Orwell fans, and why Animal Farm was so special to them. Meet journalist Andrea Chalupa, the author of Orwell and The Refugees: The Untold Story of Animal Farm. 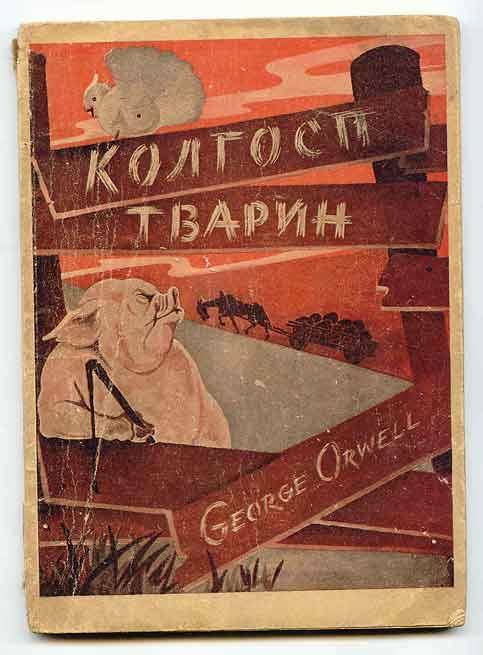 Andrea has a rare copy of “Kolhosp Tvaryn,” the Ukrainian translation of Animal Farm produced with Orwell’s help. As a teenager, her uncle Vitalij picked up a copy in a refugee camp and carried it with him when he immigrated to New York. Her family’s personal stories about surviving Stalin’s atrocities in Ukraine are shared in this inspiring discussion about the power of art. Andrea Chalupa is a journalist, author, and human rights activist. Her work has appeared in TIME, The Daily Beast, and The Atlantic. Her first screenplay “Gareth Jones”—the story of the young Welsh investigative journalist killed for exposing the Holodomor, and how his work lives on in Orwell’s Animal Farm, was selected into IFP’s Emerging Storytellers program at Lincoln Center and is in development in Europe. In January 2014, when the mainstream media was more concerned with Justin Bieber’s arrest in Miami than covering police violence against protesters in Ukraine, Andrea launched #DigitalMaidan, a social media movement that made Ukraine trend globally within minutes. An expert on social media, civic activism, Ukraine and Russia, Andrea has spoken in the Council of Europe, the National Press Club in Washington, DC, and leading universities in the US and Canada.